UTAH COUNTY, Utah, Aug. 15, 2018 (Gephardt Daily) — Lincoln Beach and Marina in Utah Lake have been closed again due to “very high” cyanobacteria cell counts, officials said Wednesday. Lab results for samples collected on Aug. 6 and 8 showed the very high cell counts, the Utah Department of Environmental Quality said in a news release on Facebook. Health officials placed all of Utah Lake on a ‘warning’ level last Wednesday due to a potentially harmful algal bloom, officials said. The public and their pets are warned to stay out of the lake due to the discovery of a blue-green algal bloom, according to a news release last week. 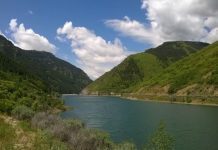 The Utah DEQ’s Division of Water Quality collected samples at the lake and found the presence of algal species that have the potential to produce toxins, the news release said. Water sample results throughout the lake have cell concentrations significantly over the recommended warning threshold level. Those recreating on Utah Lake should take caution and avoid areas of scum. Recreationists are advised to be mindful of conditions, as they may change over the course of the day. Symptoms of exposure include headache, fever, diarrhea, abdominal pain, nausea and vomiting, and sometimes allergic-like reactions from skin contact.